Crime Watch: Is this the best Edgar Award shortlist in years? Is this the best Edgar Award shortlist in years? With today's announcement (NZT) of the finalists for the prestigious MWA Edgar Awards, I'm prodded to muse whether this may be the best overall shortlist the Best Novel Award has seen in quite some time. As someone who loves crime fiction, reads a lot, and runs a crime fiction award myself, I'm always keeping an eye out on the crime fiction award happenings around the globe each year. It's great to see great books being recognised, whether they are well-known bestsellers or underappreciated hidden gems. 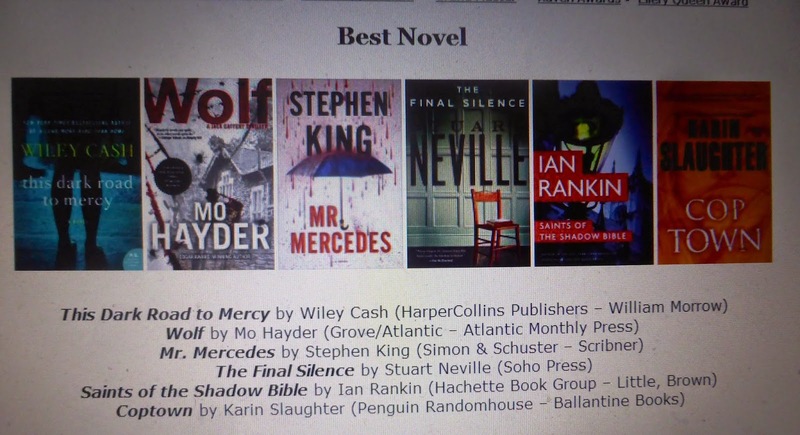 But sometimes some of the awards lists leave me scratching my head - did the judges not consider certain books? Were they determined not to reward bigger name authors who'd put out brilliant books? Or previous winners. I've often called the Edgars the Oscars of the crime writing world, and they - along with the Daggers in the UK, are probably still seen as the big daddy of the English-speaking crime awards. But in recent years I've often been left wondering when I read the shortlists (despite some absolutely tremendous and well-deserving winners like John Hart's DOWN RIVER and THE LAST CHILD). Am I just on a completely different page, reading-wise, to these judges? (though it is nice to be pointed to other great books I'd not heard of). This year though, I have no such thoughts. I've read two of the six finalists, and have them both in my top five books from 2014 (Wiley Cash's THIS DARK ROAD TO MERCY and Karin Slaughter's COP TOWN). Both are exceptional, layered, evocative crime fiction tales that truly show off what is great about this genre. I've also read terrific crime fiction from the other finalists, and see them all as modern masters. So my question is, personally, is the best Edgars shortlist we have had, across the board, in quite some time? It very well could be. I'd love to get your thoughts, and picks for a winner. And your own favourites, whether mentioned or overlooked this year. You can read the shortlists for all the Edgar Awards here. I also read two books on this list, Ian Rankin's SAINTS OF THE SHADOW BIBLE and Karin Slaughter's COP TOWN. While I thought COP TOWN was good, it didn't make my list of favorite reads this year. However the Rankin is stellar and I'm happy to see it there. I still intend to read Cash's book, I simply haven't had the opportunity to get to it yet. I wouldn't have minded seeing Koryta or Sakey on this list, but the one I think it's a crime to continually overlook is Craig Johnson. His books have consistently been as good if not better than the books on the nominee lists every year...in my opinion. You can take my input with a grain of salt, though...I'm pretty critical of most awards like this as I feel--like the Oscars--too much politics gets involved. Great comments thanks Jen. Was last year's Koryta good? I loved some of his earlier stuff (THE SILENT HOUR, THE RIDGE, etc), but hadn't anything the last couple of years, just with travelling about and stuff. I should make an effort to get my hands on more of his books again. I need to read some Craig Johnson too - I know you've been a fan for a long time. This is definitely an interesting discussion. I've never put much thought into awards for books, but this does seem like a very accessible list. I agree that it is nice to seem some familiar authors being recognized for their continued contribution. Yes, perhaps "accessible" is a great descriptor for this list Ethan - they are all relatively known authors showcasing great books (Cash is new-ish, of course, but got some publicity and acclaim for both his first two crime novels). I don't mean to disrespect prior years by asking if this is the best shortlist in years - I guess I was just pleasantly surprised that not only were there books on the list I'd actually read (often not the case with the Edgars) - and in a year I hadn't read as much as normal, bur I rated those books highly, and I recognised/had read the other finalists in general, and rated them highly as crime writers too. Always nice to chat about quality books, regardless. Thanks for your comment.